Sometimes the fish are biting, sometimes they aren’t. Unfortunately it was the latter recently when UPSAC and its local coordinator “Mahigeer” gave a class for youth at the Hermosa Beach Pier. Whenever you’re teaching a group of kids, especially ones who’ve never been fishing, it helps to have a few fish. They bore easily! Luckily smelt were still around and when the Sabiki rigs were broken out fish started coming over the railing. Every youngster was able to catch at least one fish and everyone left happy. Such is life at a pier that is part fishing and part socializing. 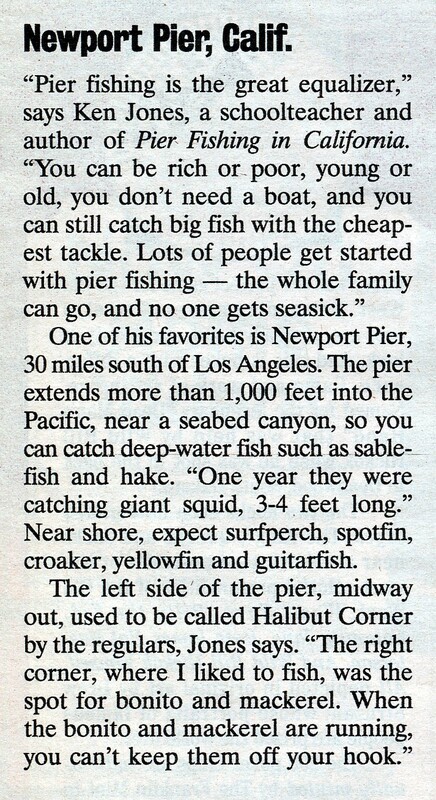 The first time I visited this pier was in 1982; the pier was crowded, live bait was available, and anglers were catching yellowtail. 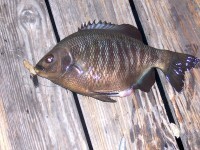 Several of the muscular fish were on the deck of the pier that day. 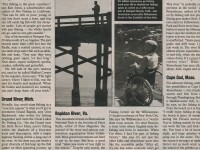 Later, I found out that more than 200 yellowtail were caught on the pier that year. In addition, several hundred “keeper” halibut and many large white seabass were also landed that year. 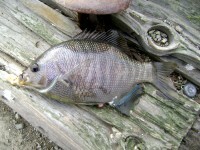 When these “large” gamefish were mixed in with the more common pier varieties, it indicated quality, quantity, and diversity rarely seen on most piers. 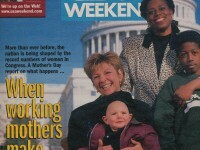 The main question was if the results reflected a fairly typical year? The answer would be no since ’82-83 were El Niño years and the warm water in those years undoubtedly had a lot to do with the larger gamefish showing up at the pier. Few years see such counts on big fish and not every visit means great or even good fishing. Nevertheless, there is usually something available and it helps explain the crowds that visit the pier. 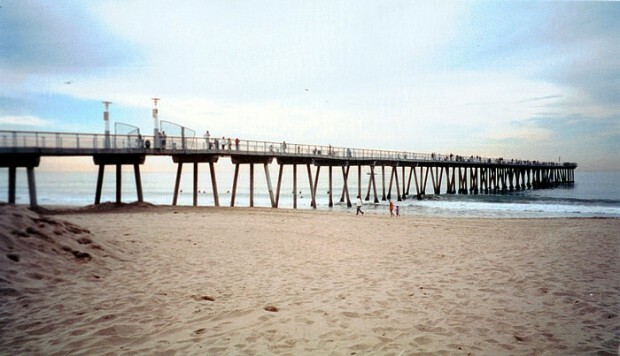 The pier itself is relatively small, only 1,140-foot-long (although one source says 1,228 feet and another says 1,168 feet), 20 feet wide, and it has a 50-by-58-foot platform at the end. 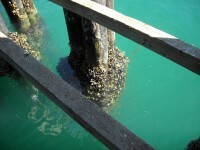 The bottom is primarily sand, and pilings have a heavy growth of mussels. 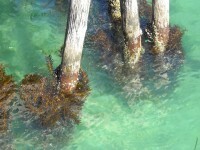 There is often kelp and seaweed near the end of the pier by late summer. An artificial 3,000-ton quarry rock reef surrounds the last 650 feet of the pier, approximately 65 feet from the edge of the pier. 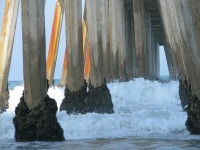 The sandy beach provides good surf action and the reef acts as an attractant for larger fish further out on the pier. Anglers fishing inshore near the beach can expect to catch barred surfperch, yellowfin croaker, spotfin croaker, corbina, and an occasional round stingray, thornback ray or shovelnose guitarfish. 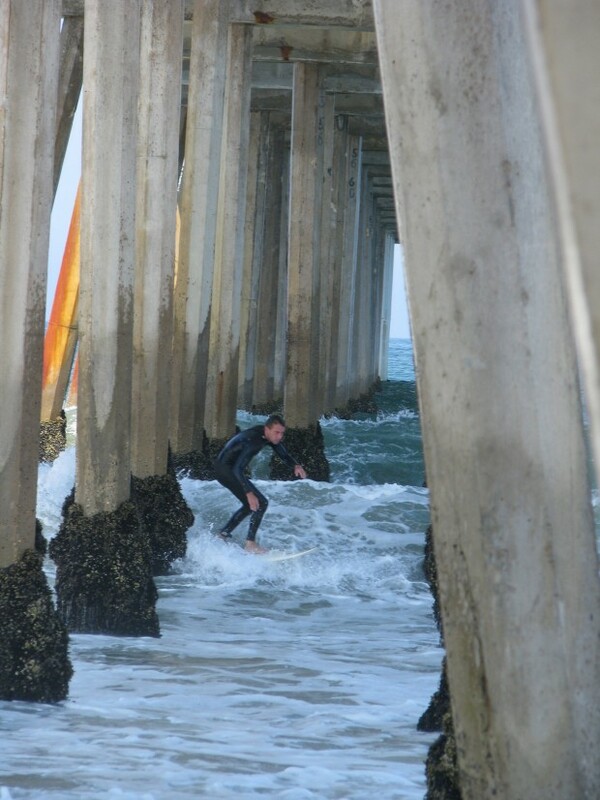 Mid-pier areas yield a variety of fish including queenfish (herring), white croaker (tomcod), jacksmelt, walleye surfperch, silver surfperch, pileperch, black seaperch, salema (I think it’s one of the better piers in California for these), and halibut. Most years will also see a run of zebraperch during the spring, a fish that is fairly rare to local piers. The last half of the pier will see even more variety. Large game fish include bonito, yellowtail, white seabass (including a 36-inch fish in June of ’08) and California halibut (including a 39-inch fish in August of ’08), the main goal for many anglers. 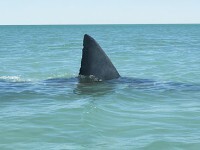 Sharks and rays are also a possibility. Thornback rays, shovelnose guitarfish, and bat rays are common most of the year while, in late summer and fall, a few thresher sharks should make a showing (although there have also been some good spring-time runs). Occasionally an angler will hook a blue shark, spiny dogfish, angel shark or a soupfin shark and a 200-pound great white shark was illegally taken in 2003. I have seen a picture of a 140-pound bat ray taken at the pier as well as a fish estimated to weigh 200+ pounds that was caught by PFIC regular Mola Joe back in the ‘80s. 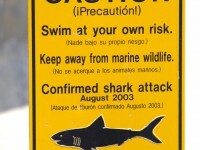 A hammerhead shark weighing about 175-pounds was also reported. Smaller fish will include California scorpionfish (sculpin), halfmoon (Catalina blue perch), opaleye, black seaperch (buttermouth), blacksmith, Pacific butterfish, sargo, Pacific mackerel, jack mackerel, Pacific sardine and jacksmelt. 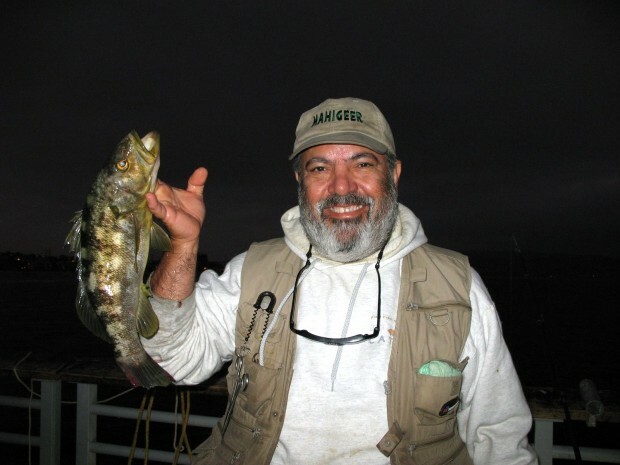 Unusual catches reported on the PFIC Message Board have included an ocean whitefish in October 2000, a salmon in January of 2002, a needlefish in June 2002, and a 30-inch or so spotted snake eel (Ophichthus triserialis) in April of 2007. Several bluefin tuna were hooked during the El Niño years in the ‘80s. 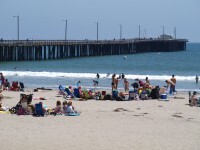 Hermosa has traditionally been an excellent pier for California lobster and regulars with the “know-how” regularly took their limits during the lobster season. Unfortunately, too many people also keep illegal lobsters out of season and too-small lobsters in season. The result: a drop off in lobster catch in recent years. Hopefully there will be a return in numbers but it will probably not happen unless the DF&G is willing to step up enforcement of the rules and people are willing to cooperate—from understanding or fear—with those rules. A lot of spider crabs are also taken although few people actually seek out the ugly creatures. For inshore fishing, the best months are winter to early spring for large barred surfperch, and summer to fall months for croakers (including some nice corbina). For all of these, the preferred bait is live sand crabs followed by ghost shrimp, bloodworms, fresh mussels, or clams. Most often used is a high/low leader utilizing size 6 or 4 hooks, and a pyramid sinker just heavy enough to hold the line in place. 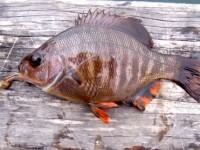 Increasingly, many anglers fish for the big barred surfperch with plastic grubs and while generic 2” clear, red flake grubs or root beer colored grubs are favored by many of the regulars, an increasing contingent also swears by the Berkley Gulp. Both will work if you use them properly. Although the barred surfperch will hit at almost any hour, late afternoon to after dark seems the best times for the yellowfin croaker, spotfin croaker, China croaker (black croaker), and corbina. An unfortunate local practice, one that is far too common throughout many areas of southern California, is snagging corbina with big treble hooks. Some local groups are working to outlaw the practice but the non-sportsmen continue to do this dastardly (and dumb) deed for the present. In the mid-pier area many people also use the high/low leaders although the quarry now becomes tomcod (white croaker), bass, and croakers that have wandered away from the surf area. Bait rigs are also common, especially Sabiki riggings, and they will latch onto queenfish, topsmelt, jacksmelt, sardines and mackerel. Many anglers also fish for perch (rubberlip, black, pile and opaleye) down around the pilings using bloodworms, mussels, or small pieces of shrimp. Lots of salema are also present and for these, a small strip of squid about 2-3 inches long, fished on a size 6-8 hook, at mid-depth levels should produce fish. 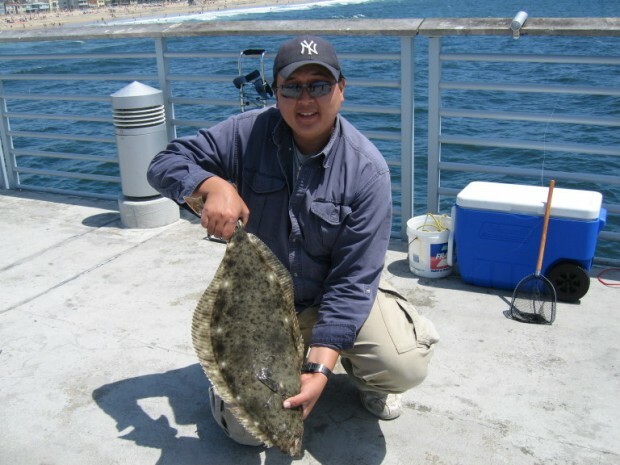 This mid-pier area, especially late spring to summer, is also a good best spot for California halibut. Use a live bait leader baited with live anchovies, queenfish, smelt, shinerperch or baby macs that you’ve been able to net or get with a bait rig. Live bait produces almost all of the legal sized halibut although a few also fall to lures like Big Hammers and Fish Traps. A cast on the left side of the pier opposite “halibut alley” has also often been good for me. For many of the reef species, including fish such as calicos (kelp bass), perch, an occasional rockfish, salema, and others, a decent cast is required (the reef is approximately 65 feet from the pier) but well worth the effort. Also remember that if you are specifically seeking out reef species such as perch use bloodworms or mussels (probably ones you have toughened). At the very end of the pier, much of the angling focuses on the pelagic species like mackerel, jack mackerel and bonito (some years), although warm water months, as mentioned, may also see a few yellowtail, barracuda and white seabass. Many anglers here use bait rigs to capture small baitfish—sardines, baby mackerel, smelt—and then use the baitfish on top for the bigger game fish or on the bottom for halibut. Many times though it is just mackerel. The mackerel fisherman will generally use a strip of squid and a split shot sinker while others may use a multi-hook leaders. Most bonito fall to a cast-a bubble and a bonito feather although when it’s windy you might want to try a feather trailing behind a golf ball. Lures such as MegaBaits, Krocodiles, and even Buzz Bombs will also often yield fish. A number of regulars fish for sharks from the pier. The most valued seem to be leopard sharks and thresher sharks although any big shark or ray is highly respected (and an angler in September of ’98 landed a 6-foot-long, 50+pound soupfin shark). 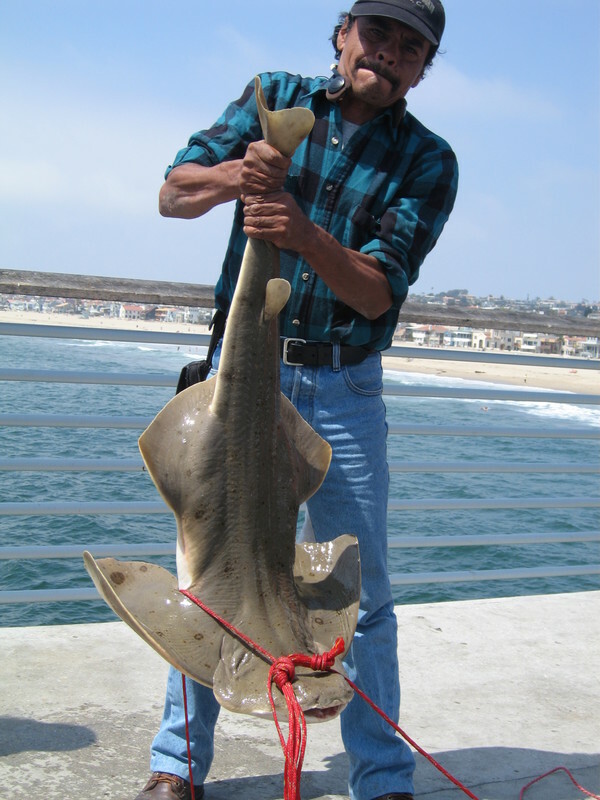 Thus a large shovelnose guitarfish, bat ray, or blue shark will also win points for the angler. Still, the threshers seem to be the special prize and fish approaching (and sometimes exceeding) 100 pounds are caught each year. Tackle of course is fairly heavy. 30-60 pound monofilament line, hooks in the 4/0-6/0 range, and steel leaders are fairly common. The best bait? Lively jack mackerel or Pacific mackerel lead the list. The regulars of course are the ones who know how to pursue the “large” gamefish. When small-sized Spanish mackerel (jack mackerel) or greenbacks (Pacific mackerel) are available, the regulars will use a bait rig to catch them for bait. Then, a long cast is made with the main line, as close to the near-by reef as possible. Next, a sliding leader baited with the mackerel is slid down the line toward the reef. If large fish are present, this is often the preferred method. Large anchovies, smelt, small queenfish, butterfish and shinerperch are also used but they do not work as well for bait. 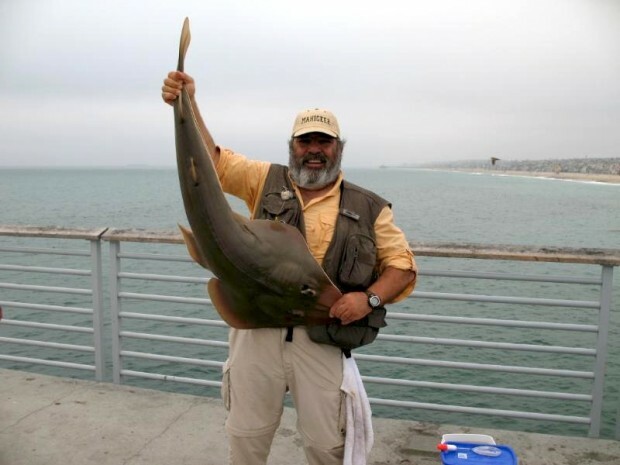 The hoped for results are keeper-size white seabass, yellowtail or halibut but the anglers will gladly take home large calicos (kelp bass) or the above-mentioned sharks and rays. As said, the action isn’t always great or even good but if you come equipped with the right bait and techniques you can normally expect to catch something at the pier. It’s always said that 10% of the fishermen catch 90% of the fish; apply and practice the techniques discussed and you should be part of that 10%. Facilities: There are lights, benches, and fish-cleaning stations on the pier. Restrooms are found near the front of the pier. Parking is available adjacent to the pier at a cost of $1 an hour in the parking lot. Some metered parking is also available on nearby streets; most are $.50 an hour with a 2- or 3-hour maximum. As mentioned, finding parking can be a problem during the summer, especially on weekends. The best bet is to arrive very early in the day. Handicapped Facilities: Some handicapped parking near the pier but non-handicapped restrooms. The pier surface is cement and the rail height is 40 inches. Posted for handicapped. How To Get There: Take the Pacific Coast Highway (Hwy.1) to Pier Avenue and follow Pier Avenue west to the pier. Management: City of Hermosa Beach.